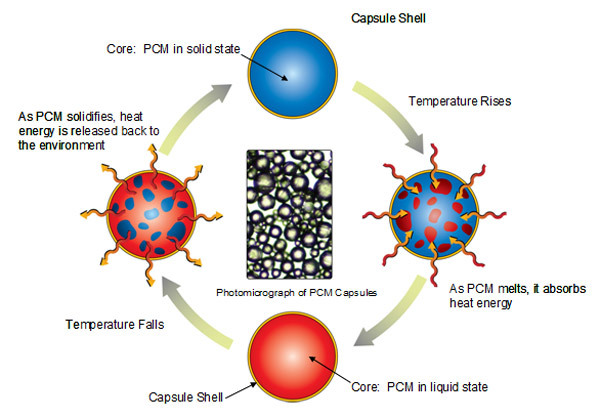 Phase Change Materials, usually abbreviated as PCM’s are wonderfully useful for thermal storage applications. These materials make it possible to store large amounts of heat relative to a substance’s mass. They do this in a similar way to the working refrigerant of a vapor compression system in a refrigerator except that unlike refrigerant, these materials usually undergo solid-liquid or liquid-solid transition and are intended to absorb large amounts of heat only to be released later. Water ice is no doubt the most common PCM and arguably one of the best. Clean water normally freezes at 0 degrees Celsius. 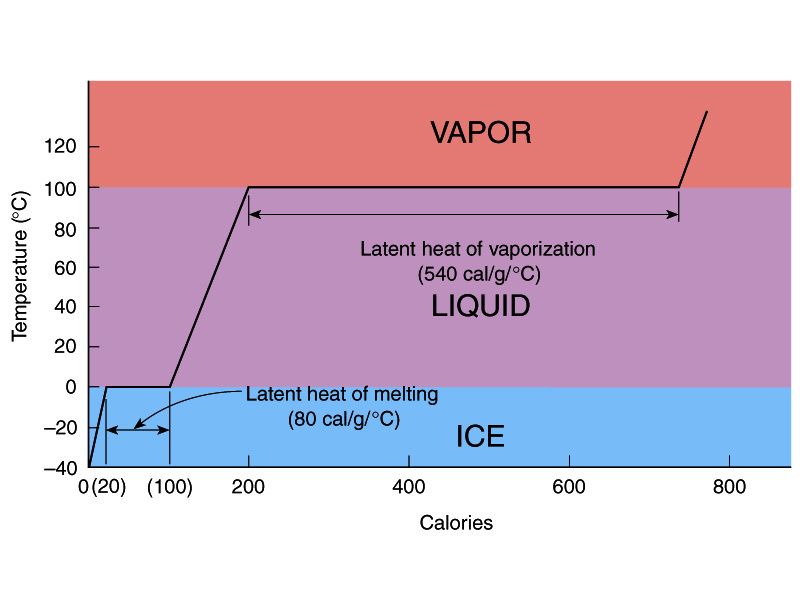 Water is a great storer of heat as it is, but the energy to melt one kilogram of water ice is 80 times the energy it takes to raise the temperature of one kilogram of liquid water one degree Celsius. That means if the energy it takes to melt a kilogram of ice into liquid water were applied again, it would raise the temperature to around 80 degrees C! This transition from solid phase to liquid phase is accompanied by a quantity of energy called it’s ‘enthalpy of fusion’. Every PCM has an enthalpy of fusion specific to it; some are sharply defined and others are not. That is, some will give up there heat quickly upon reaching their fusion temperature and others require ‘supercooling’ in order to start fusion. As I said, PCMs are very useful and there are a wide variety of them, each with particular phase change temperatures and latent heat capacities. For decades in the 19th and early 20th century millions of tons of water ice was either harvested from lakes in winter or mechanically derived for the purposes of refrigeration. It is not just that water ice is very cold and useful to preserve food, but also that the temperature remains constant in and on the surface of a block until it has all melted. Another useful PCM is solid carbon dioxide or ‘dry ice’. It is one of the few PCMs that does not melt but sublimates. It goes directly from a solid to a gas and does so at a chilly 78 degrees below 0 C.
Not all PCMs are used for refrigeration purposes. Quite a few are used in heating applications. Paraffin wax being one, depending on the quality, melts somewhere in the neighborhood of 40 to 60 degrees C. This makes it quite suitable as a heat storer for home heating systems. Another useful latent heat storer is what is called Glauber’s salt also known as Sodium Sulfate. This stuff melts at around 32 degrees C making it very suitable for solar heating applications. The only drawback of the stuff I know of is it needs agitated periodically and there may be limits to the number of cycles of freeze/melt. Some PCMs are metals and are used in very high heat applications on the order of hundreds or thousands of degrees. There are a great deal of custom PCMs made from proprietary mixtures of various salts or toxic petrochemical concoctions serving the needs of industry. Some are practical and sustainable, others should never have been made. Some pretty cool uses of PCMs I’ve seen are micro-encapsulated in small plastic or paper vessels and used to moderate the temperature in solar hot water tanks, spacecraft climate control, embedded in drywall, embedded in concrete, keeping your lunch box cold, increase the thermal capacity of hot water heaters, make ice at night to cool large buildings during the day and even a coffee mug that keeps your drink at the ideal temperature. My interest in PCMs has to do with building better appliances; in particular, a refrigerator. A large cold mass maintaining refrigeration temperatures has a lot value. For one, any thermal mass will keep things cold without requiring constant energy input to operate a cooling system. This adds some security when the power goes out for several hours and you still have a chilly refrigerator cabinet. Some energy sources are available only at certain times or are sometimes more abundant. Solar and wind come to mind. Some off grid solar installations have ‘excess’ power during the day and this electricity could be used to freeze a block of ice to get though the night. A ‘water ice battery’ if you will. Wind turbines could be made to directly power a refrigeration compressor when the wind blows. Skip the electric conversion. Solar thermal might be used to operate an absorption or adsorption refrigeration system. Last, but certainly not least is a human powered refrigeration system. 🙂 In this example, the operator is not available 24 hours a day to pedal a compressor. This work is done perhaps once a day to freeze a mass of ice or more likely, brine so that the cabinet remains cold until the next day. I have a number of thoughts on how to implement such a thing, but one thing I’m sure of is that pure water ice is not suitable as a PCM in this application. As I said, ice was used to preserve food for many years and there was a constant struggle to maintain temperatures below 50 degrees Fahrenheit so a fusion temperature of 32 degrees Fahrenheit, 0 degrees C is not suitable, but a much lower -20 C may be. 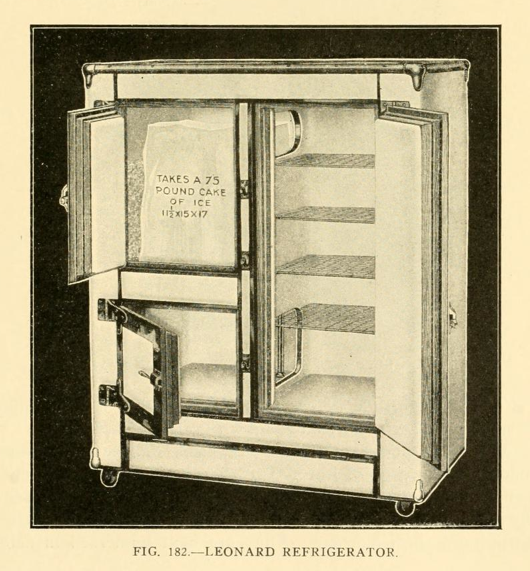 I would want a place to keep items frozen as well and I think that temperature may work. The PCM would most likely be made of a ‘depressed’ water solution; where the freezing point is lowered by added certain substances.. A salt mixture or alcohol mixture to the correct proportions would lower the heat capacity, but would still serve as an effective thermal mass. Yet one other PCM application in a domestic refrigerator I fancy is in discharging ‘waste heat’. Now I use the term waste heat to mean the heat discharged by the refrigeration system in the process of pumping down the refrigerator cabinet temperature. If at all possible no heat should be wasted. Typical condenser temperatures coming out of a refrigerator could be used to heat a room or preheat the cold water supply to a domestic water heater. Cold water in most homes feeding the water heater is around 15 to 20 degrees C, a temperature that could substantially reduce the discharge pressure of the compressor, lower the compression ratio and reduce the power requirements of the refrigerator. The problem is, the cold water only flows when someone opens the hot water faucet so the ‘chiller water’ only runs intermittently. This is where the PCM comes into play, similar to doing the refrigerating work to produce ice when power is available, a condenser PCM absorbs the ‘waste heat’ and gives it up to the cold water when it is supplied. Of course, a similar application of a condenser PCM would be atmospheric radiative cooling. A typical refrigerator compressor might run 20 minutes out of every hour. That means for 40 minutes little heat is being dissipated by the condenser. If a PCM were used to absorb heat during the system’s ‘on time’, it could then dissipate that heat throughout the rest of the hour or day. The temperature difference between the condenser and it’s environment wouldn’t need to be as high which would reduce the load on the compressor. There are a lot of interesting possibilities for PCMs and with a little creative thinking we can make use of safe, non toxic materials to reduce power consumption and come closer to appropriate technology with refrigeration. I looked a little closer at the propane pressure – enthalpy charts. If I am reading them correctly, for a heat pump application, the evaporator side should be around 60 PSIA and the condenser side around 110 – 120 PSIA. Thanks Harry; that site is useful. Check out the ASHRAE series of books, especially the Fundamentals editions. They are chocked full of this data, along with pressure enthalpy diagrams for many refrigerants. Hi, thanks for the suggestions. By the way, I am very impressed with what you are doing in the area of propane based refrigeration bench testing. I am not sure if you received my email regarding the idea of working on some related heat pump / refrigeration experiments together ? If not I will send it from a Hotmail account in case somehow mine got stuck in your spam box.